A veiled threat by Apple to close its iTunes store has emerged 18 months after it was issued and just a day before royalty rates are to be set. Apple opposed the rate hike and has said it is unwilling to raise its 99 cents a song price or absorb a rise. In April 2007 the company's vice president for iTunes, Eddy Cue, submitted testimony to the Board at the Library of Congress. "If iTS (iTunes Store) were forced to absorb any increase in the mechanical royalty rates, the result would be to significantly increase the likelihood of the store operating at a financial loss - which is no alternative at all. "Apple has repeatedly made clear that it is in this business to make money, and would most likely not continue to operate iTS if it were no longer possible to do so profitably," said Mr Cue. The National Music Publishers' Association has asked for the royalty rate increase and has said it believes everyone will benefit because the digital music market is growing. "I think we established a case for an increase in the royalties," said David Israelite, president of the NMPA. "Apple may want to sell songs cheaply to sell iPods. We don't make a penny on the sale of an iPod." The Recording Industry Association of America said sales of digital songs and albums rose 46% last year to $1.2bn (£652m). 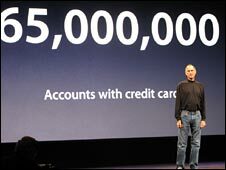 Apple pays an estimated 70% of digital music revenue to record companies which in turn pass on a percentage to artists. It is that percentage that is expected to be changed on Thursday. The forthcoming decision by the three judge panel will set rates for the next five years. It will be the first affecting digital sales. Meanwhile the Digital Media Association, which represents Apple and other online music services, has asked for the rate to be pegged at 4.8 cents a track. With CD sales falling last year by 20% to $7.4bn (£4bn), record companies are unlikely to be willing to soak up any increase in rates. Greg Sandoval at CNET said the timing of the emergence of the Apple document is interesting. "When it comes down to mass appeal, Apple holds all the cards.
" If word gets out that music publishers are trying to stick it to consumers, and Apple is fighting to keep prices down on their behalf, well, there's liable to be public backlash against the labels. "If this thing follows the normal course, there would be calls for boycotts, protests and so on." Piper Jaffray estimates that Apple will sell 2.4 bn songs this year, giving it an 85% share of the digital music market.